When Ole Miss and Auburn met earlier this season in Oxford, the Rebels won the game by holding the Tigers to their lowest point total (67) and lowest field goal percentage (32.8), marks that had stood all season–until Wednesday night, that is. The win gives Ole Miss (17-7, 7-4 Southeastern Conference) a huge road victory over a top 20 team in the NET—which helps the Rebels’ resume when it comes time for selection Sunday. To open the contest, there didn’t seem to be much of a sense of urgency on the part of either team, as only one shot was made prior to the first media timeout. Four minutes into the game, the only player who had scored was Ole Miss’ Bruce Stevens who hit a wide open three-ball. Following the TV break, it was apparent that any early jitters had worn off and both squads were ready to play ball. A deep Breein Tyree three-pointer followed by a couple of Auburn free throws had the game knotted at 6 apiece with 7 minutes off the clock. The next several possessions saw a stout Ole Miss defense help the Rebels’ offense go on an 8-0 run, putting head coach Kermit Davis’ team up 17-9 at the 8-minute mark of the opening frame. However, the Tigers quickly brought themselves back to within 3-points, prompting a Kermit Davis timeout with 6 minutes remaining in the half. Ole Miss and Auburn traded buckets following the timeout, and the Rebels were able to keep their lead due in large part to solid play from Devontae Shuler. 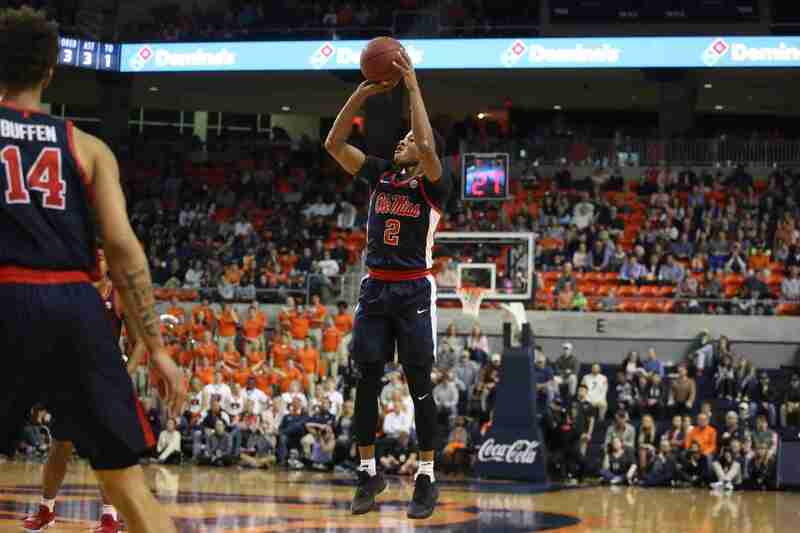 Junior standout Breein Tyree kept the shots falling for Ole Miss with a jumper of his own, before then giving Shuler the chance to put the Rebels up by 10-points late in the first half. Shuler’s 12th point of the evening gave Ole Miss its biggest lead of the game. Unfortunately, a few fouls in the last couple of minutes of the frame gave Auburn the opportunity to go on its own 7-0 run that cut the deficit to six, 30-24, in favor of the Rebels heading into intermission. At the half, Shuler and Tyree had 12 points and 10 points, respectively. There was not much statistical separation between the two teams, with the exception of turnovers: Auburn had 8 turnovers to Ole Miss’ 3 in the first 20 minutes. Coming out of the locker room to begin the final frame, it was Terence Davis who gave Ole Miss a quick spark with a wide open three from the far corner. Davis, however, picked up his fourth foul on the ensuing possession, forcing Coach Kermit to pull T.D. from the game. The Rebels, who were also without Blake Hinson due to illness, responded in a big way. A pair of three-pointers from Shuler and Tyree put the Rebels back up by 10 points with just under 15 minutes to go in the contest. At that point, Ole Miss had scored 30 of their 39 points from downtown—something you rarely get to see in the SEC. Refusing to give up on their home court, Auburn went on yet another big run, this time 8-0, bringing the Tigers to within two points of Ole Miss, 39-37. Fortunately, Zach Naylor’s 3-ball — the Rebels’ eleventh long-ball of the night— put Ole Miss back up by five points at the media timeout. 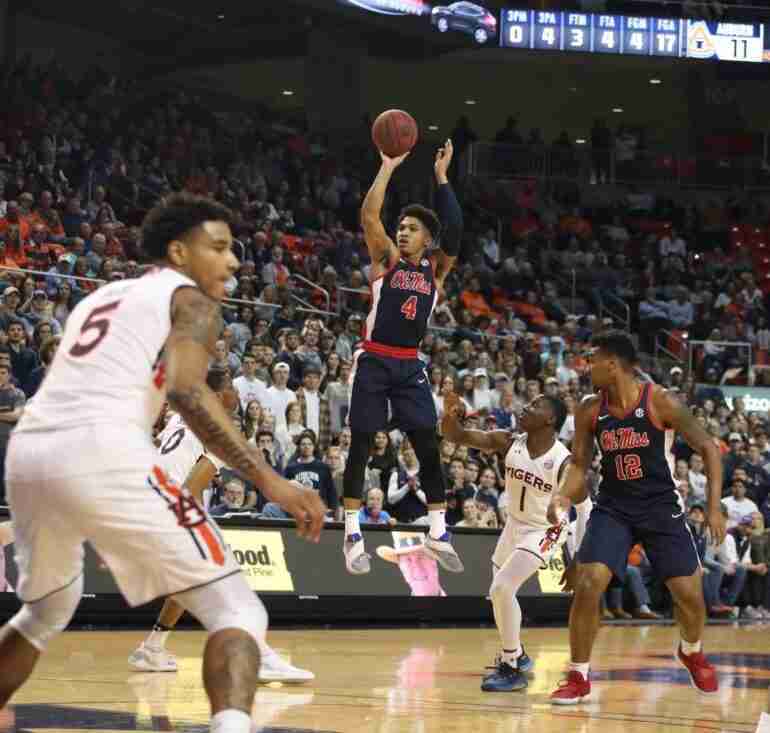 Tyree’s subsequent trip to the line put Ole Miss up by seven with 9 minutes remaining, but Auburn, again, refused to fade away, forced Ole Miss into a six-and-a-half-minute scoring drought which saw Auburn bring the deficit to as low as four points. But Tyree and Davis rallied the Rebels and hit back-to-back shots from downtown to put the Rebels up six, 54-48, with just under 4 minutes to go. At this point, the Auburn strategy went from aggressive to somewhat psychotic. Head coach Bruce Pearl felt Auburn could take advantage of the Rebel offense with a press defense, so that’s all the Tigers did for the remainder of the contest. For a bit, Pearl’s strategy looked to be working for the Tiger squad, as they brought themselves to within three points of Ole Miss. A block by Auburn’s Chuma Okeke gave Auburn the ball with just under a minute to go, but a missed Tigers’ shot and a defensive rebound by Bruce Stevens led to Tyree at the charity stripe. His free throws closed out the 60-55 victory over the Tigers. Tyree led all scorers with his sixth 20-point game in a row, notching 20 points, exactly, on the night. Devontae Shuler added 17 of his own and Terence Davis added another 8 on the evening. Rebounds were spread out fairly evenly among all Rebels with no single player grabbing more than five on the night; however, Ole Miss wound up tied with Auburn on the glass at 34 boards for both squads. Thirteen of the Rebels’ 19 shots were from downtown while another 9 came by way of the charity stripe. Ole Miss swept the season series and has now won 12 of last 14 in the overall series, five of six at Auburn. The Tigers only led for 21 seconds of the entire season series, tonight, after the Rebels had a wire-to-wire victory at The Pavilion. 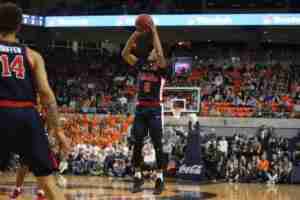 The Rebels held Auburn to their lowest point total (55) and field goal percentage (32.7) this season. Head coach Kermit Davis became just the fourth coach in Ole Miss history to win 17 of his first 25 games. Ole Miss made a season-high 13 three-pointers, the eighth-most in school history; the 33 attempts were the fifth-most in school history. Breein Tyree scored 20 points for the sixth straight game. Devontae Shuler made a career-high 5 threes. Zach Naylor tied a career-high with 5 points. With freshman Blake Hinson missing the game due to the flu, fellow freshman KJ Buffen started in his place; it was Buffen’s second career start (Feb. 2 vs. Mississippi State). Ole Miss limited Auburn to 24 points in the first half, the Tigers’ lowest output in a half this season. Ole Miss heads back home after two consecutive road wins and will play host to the Missouri Tigers (12-11 Overall, 3-8 SEC) this Saturday afternoon. Tip off is set for 2:30 p.m. (CT) and the contest will be televised on the SEC Network.